$ 50 OFF USING COUPON CODE EZ50OFF. LIMITED TO FIRST 20 CUSTOMERS ONLY! PERFECT GIFT! Want a garden but have limited space? Long for home grown vegetables but don't have the time for maintaining a garden? Look no further for solutions! The Ez Gro Patio Garden is a vertical gardening system that works in small spaces--allowing you to grow in 20 separate potting spots. A timer and irrigation pump saves times and allows your garden to be nearly maintenance-free! Ez Gro Garden- Beautiful! Easy to maintain! Requires very little space and time! The Ez Gro Patio Garden is 4' tall and requires only 1 1/2" of floor space- a true vertical gardening design! Beautiful Terra Cotta. Easy to assemble! Start planting right away. Ez Gro Organic Medium means no soil needed. 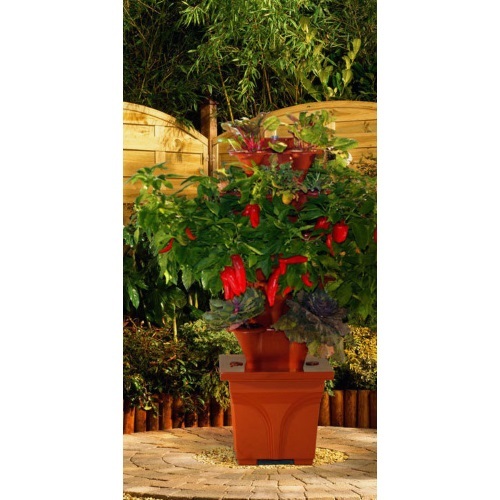 Kit includes all materials needed- just add your plantings. No green thumb? Don't despair! The Ez Gro Patio Garden is nearly maintenance free, requiring water and nutrients to be added to the reservoir every 10-14 days. A timer on the irrigation pump can be adjusted for your particular plantings needs--even up to 7 times per day. Pests and diseases plaguing your traditional gardens? Our customers report that the Ez Gro Garden Patio doesn't have these problems! Not just functional, the Ez Gro Patio Garden is a showpiece! Your friends and family will Ooo and Ahh over the simple yet elegant design. Here at Vertical Gardening Systems, we have an Ez Gro Garden Patio in our office. Nearly every customer that visits us comments on the ingenuity of the design and how easy is appears to maintain! They are right! So beautiful, so easy!